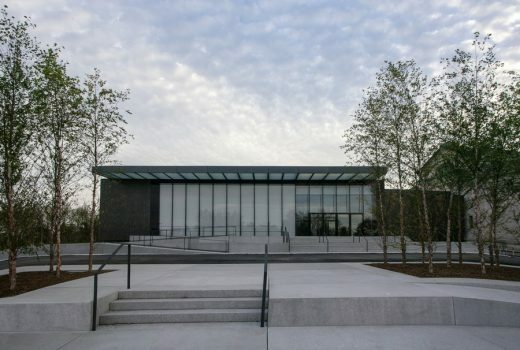 12 July 2013 – The new East Building of the Saint Louis Art Museum, designed by David Chipperfield Architects with technical assistance from HOK, opened to the public in St. Louis, Missouri, USA on Saturday 29 June 2013. The museum is home to one of the most comprehensive art collections in the US and is located in the city’s recently restored Forest Park. Started in 2005, the new 18,500 m2 East Building accommodates the museum’s growing modern and contemporary art collection, together with temporary exhibition spaces. Arup has collaborated with David Chipperfield Architects, HOK and local firm William Tao & Associates, to deliver a space that is lit using natural daylight and provides the precise environmental conditions for the preservation and contemplation of art. The museum was officially opened by Governor Jay Nixon, Mayor Francis Slay, County Executive Charlie Dooley, President of the Museum’s Board of Commissioners Barbara Taylor, and Museum Director Brent Benjamin. ST. LOUIS, May 16, 2013 — The Saint Louis Art Museum has announced that it will celebrate the grand opening of its new East Building with a ribbon-cutting ceremony on Saturday, June 29. The Museum will be open to the public from 10 a.m. to 10 p.m. on Saturday and from 10 a.m. to 5 p.m. on Sunday, June 30, offering extended hours for viewing the collections and participating in a range of celebratory art projects, performances and programs. Consistent with the inscription carved in stone above the Main Entrance – “Dedicated to Art and Free to All” – all grand opening events are presented without charge. Designed by David Chipperfield Architects with technical assistance from St. Louis-based HOK, the East Building will increase gallery and public space by 30 percent and will house 21 new galleries for the collection and temporary exhibitions. The inaugural exhibitions in the East Building will feature 230 works from the permanent collection, 55 of which have not been on view for at least 20 years. The installations, which are nearly complete, will illustrate the Museum’s strengths in postwar German art and showcase developments in postwar American art. The expansion project also has enabled the renovation and reinstallation of the iconic 1904 building, designed by Cass Gilbert. More than 1,450 works of art have been reinstalled in 68 galleries; approximately one-third of these works have not been on view for at least 20 years. Among the reinstalled galleries are new installations of Native American and Ancient American Art, African Art, Korean Art, Islamic Art, and a sequence of galleries for European painting and sculpture spanning from the Renaissance to the mid-20th century. Another highlight of the opening celebration will be the unveiling of Stone Sea, a major new outdoor sculpture by Andy Goldsworthy that symbolically bridges the past and future of the Museum.